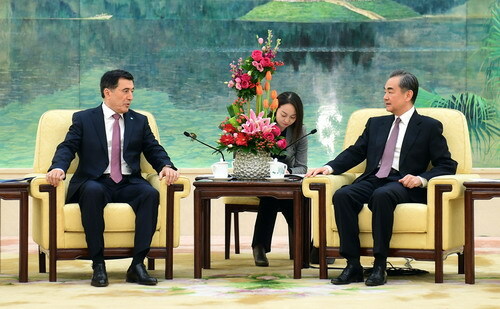 On February 15, 2019, State Councilor and Foreign Minister Wang Yi met with newly-appointed Secretary-General of the Shanghai Cooperation Organization (SCO) Vladimir Norov in Beijing. 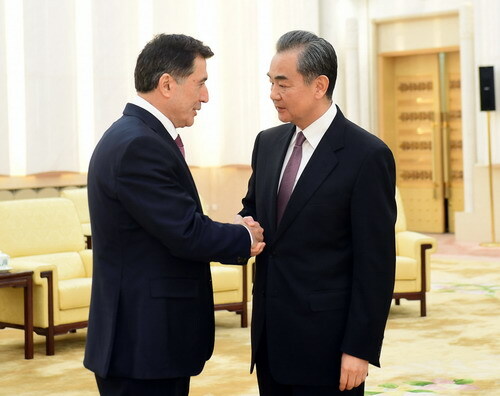 Wang Yi congratulated Vladimir Norov on the assumption of his new post and expressed that the SCO has constantly kept pace with the times since its establishment and made positive contributions to the peace, stability, development and prosperity in the region, becoming a new type of regional organization with great vitality and providing more positive energy for the uncertain world. The Chinese side is willing to, together with the SCO Secretariat, maintain close communication, carry forward the Shanghai Spirit and enhance the awareness of a community with a shared future; well implement the outcomes of the SCO Qingdao Summit and deepen unity and mutual trust among old and new SCO member states; continuously advance cooperation in counter-terrorism and safeguard regional security and stability; initiate feasibility study on free trade zone and tap into potential for mutually beneficial cooperation of SCO member states; carry out more people-to-people and cultural exchanges and consolidate the friendly social and public opinion foundation; and promote the integration between the construction of the Belt and Road Initiative and development strategies of various countries in an in-depth manner to facilitate regional integrated development. Vladimir Norov said that I was much honored to be the new SCO Secretary-General and thanked the Chinese side for providing the Secretariat with strong support. The SCO is of significant international influence and I will actively fulfill my duties to deeply implement the consensus reached by leaders of SCO member states and the outcomes of the SCO Qingdao Summit and strengthen political mutual trust and cooperation among the member states, so as to constantly make contributions to the development and growth of the SCO.